Image 1. 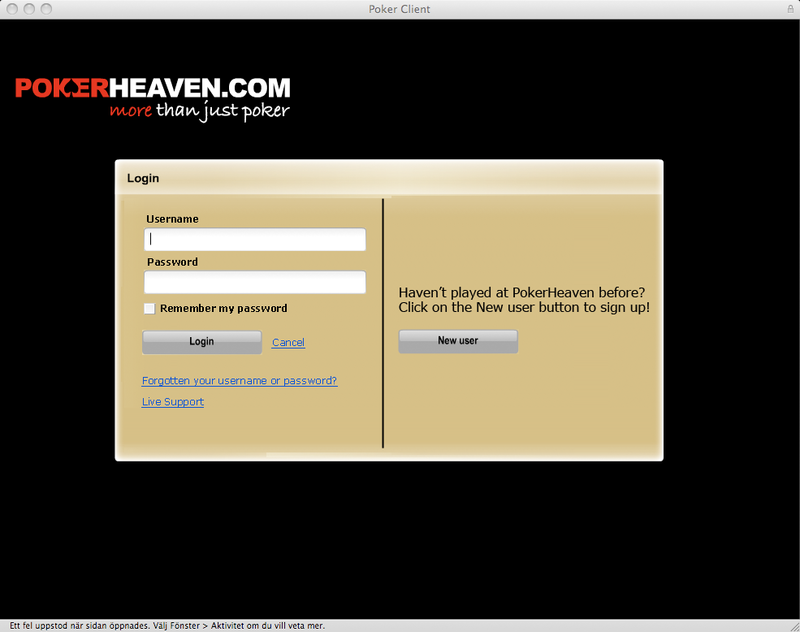 Login dialogue – PokerHeaven’s instant poker client. I believe PokerHeaven and gaming operators using Boss Media’s instant poker are losing players because of a bad user interface. I watched poker on the Poker Channel yesterday and remembered that I have an account at PokerHeaven so I went to their website. There I noticed that they had an instant version of their poker client which was great since I am using a mac. I started the client and clicked on the login button and came to the login dialogue in image 1. Since I hadn’t played for about 6 months I’d forgotten my username and password so what to do then? I looked for information in the login dialogue but there wasn’t any information what so ever. What do you do then? I tried a username and password I thought was right but I got an error message saying that I should contact the support since the username or password wasn’t right. PokerHeaven do have a live support service which is a great service but I shouldn’t need to go back to the portal to retrieve my username and password. It should be available within the poker client! If a player can’t login to start playing then he is a lost customer! So this week’s redesign makes a few quick modifications to the user interface of the login dialogue in Boss Media’s instant poker client. Image 2. My suggestion for the login dialogue. I’ve made the username, password fields and login button in a straight line down so that it is easier to fill out. I’ve added a “Forgotten username or password?” link leading to a retrieve username/password function. I’ve added a “Live Support” link starting the live support. I’ve changed the “Cancel” button into a link insted to make the “Login” button stand out more. Small modifications to the user interface can make a big difference in how fast a player can start playing and I believe that these changes can be implemented really fast and will make it easier for a player who has forgotten his login information to get it and start playing faster. I for one did not contact customer support so I didn’t play at PokerHeaven.